Confession: I was equal parts attracted to and repulsed by Constantine Maroulis when he was a contestant on American Idol. I was attracted to the rocker in him, as he was one of the first American Idol contestants that didn’t look like a modern day clone of Frankie and what’s her face? Annie? Shoot. I gotta Google. I loved that about him. I loved his hair. His “the hell with it all” attitude. His voice. I’ve since come to respect him quite a bit as his recent performance on America’s Got Talent showed he has reined in the eye-f&#k. He’s now a Tony-nominated Broadway star who is coming to Pittsburgh in November headlining the Rock of Ages show and guess what? Just for you, readers and friends and twits and facebookers of That’s Church. And I do like my pleasures guilty and exclamatory. Tony Award® Nominee and “American Idol” finalist, Constantine Maroulis, reprises his acclaimed performance as Drew in the First National Tour of the five–time Tony Award® nominated smash–hit musical ROCK OF AGES In 1987 on the Sunset Strip, a small town girl met a big city rocker and in LA’s most famous rock club, they fell in love to the greatest songs of the ‘80s. 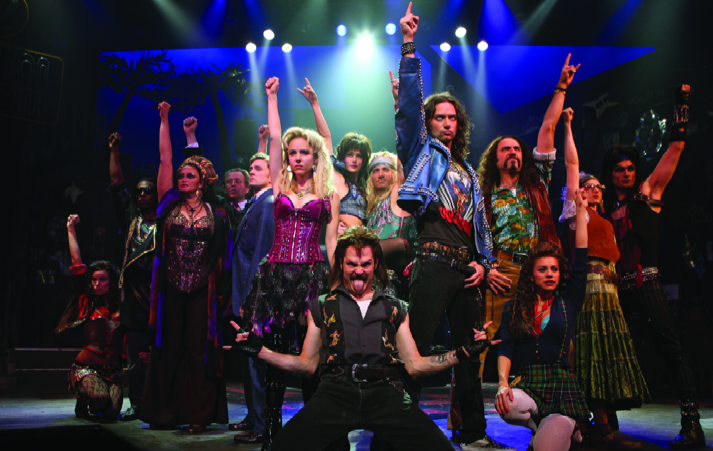 It’s five time 2009 Tony® nominee ROCK OF AGES, an arena-rock love story told through the mind–blowing, face–melting hits of JOURNEY, NIGHT RANGER, STYX, REO SPEEDWAGON, PAT BENATAR, TWISTED SISTER, POISON, ASIA, WHITESNAKE and many more. Don’t miss this awesomely good time about dreaming big, playing loud and partying on! Am I alone in that as soon as I see the word “WHITESNAKE” I have a mental image of Tawny Kitaen writhing on a car? Presale is valid anytime Monday 10/4 through Thursday 10/7, and the tickets go on sale to the general public Friday 10/8. So I’m telling you NOW, so that you can fire up your credit card to be ready on Monday morning as the good pre-sale tickets go fast. I know lots of people emailed me after the Phantom to tell me how amazing their seats were and that they’d never sat that close before. Use promotional code CHURCHROCKS to order your tickets to ROCK OF AGES before they go on sale to the public on Friday, October 8th! PNC Broadway Across America – Pittsburgh is a presentation of The Pittsburgh Cultural Trust, Pittsburgh Symphony and Broadway Across America. I am not being compensated for writing this post or holding this presale in any way other than a pair of tickets to the show so that I can review it. I am simply doing this out of my love for Broadway, the Pittsburgh Cultural Trust, and a boy who learned to tone down his eye-f#*k.
I saw this show on Broadway and it is pretty fantastic. It’s the perfect way to drag someone out to see a musical production that might not normally ever want to go see one (that’s how I ended up there)… I should mention that I’m someone who loves popular music, but despises shows like American Idol and Glee. Very cool that it’s coming to town. I’ll see it again. Nice! Thanks for the pre-sale! I’m definitely going to look at ticket prices. I’ll be on the lookout for if they come to Baltimore. Saw it on Broadway and surprisingly it was really good! Constantine’s understudy performed in our show, but I might just go see it again here in the ‘burgh! HAHA! I might be a little ashamed to say I felt the EXACT same way about him on AI. Loved that he was a rocker, but everytime I’d watch him was all must you try so hard? You’re ruining it! Also lol’d about Whitesnake! I will never forget those eyes – more like eye-yucking. I saw it on Broadway with Mr. Sleazy Eyes, and I must say, if you possibly can, go with someone who has a few beers in them and remembers the 80’s. It’s a full-on hair ballad rock cheese fest. And yes, I squealed and clapped every time they started a new “best of” number. YAY – just bought my tickets – great way to celebrate my husband’s birthday! Maybe we’ll spend Saturday night! Pingback: That's Church » Reminder!